Nasheed’s wife Lailla and a daughter fled to neighbouring Sri Lanka when violence erupted in the Maldives after Nasheed’s so-called ‘resignation’ on 7 February, which he said he was forced into at gunpoint. 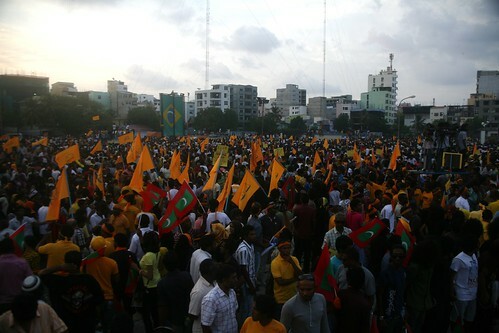 Three days later, the Maldivian community in Colombo came out on the streets to demonstrate in support of their ousted leader. Perera says the duration of the family’s stay depends on what they want to do. Chair of Nasheed’s Maldivian Democratic Party (MDP) ‘Reeko’ Moosa Manik was also in Colombo, reportedly being treated in hospital for injuries he received when police beat pro-Nasheed demonstrators in the country’s capital, Male. Nasheed has made an emotional appeal to the Sri Lankan government to ‘talk to all sides’ and support him in his call for elections. On 14 February the Sri Lankan TV station Sirasa, which has a correspondent in Male covering the crisis, broadcast an exclusive interview with the ex-president in which he said: ‘We call upon our friends, our cousins, everyone in Sri Lanka… Please make sure things are on track... There is no other country to whom we would appeal passionately like this.’ He said that his party’s MPs were being ‘targeted by police’. As peaceful pro-Nasheed rallies continue to be held in its capital, the new government in the Maldives has appointed a vice-president, presidential advisor and some cabinet ministers, Sirasa reported. The newly appointed Maldivian cabinet includes members from all major parties except the MDP, according to Deputy High Commissioner for the Maldives in Colombo, Hussain Nyas. The MDP has rejected the idea of a ‘unity government’. While the hospitality extended by Sri Lanka to Nasheed’s family is not in doubt, the government’s official stance in relation to the unfolding events in the Maldives has been measured. Perera said the government would like the Maldivians’ problems to be solved by its legislators: ‘We don’t wish any foreign interference by anybody.’ Asked about the government’s response to Nasheed’s appeal, he said the events needed to be investigated ‘in court, in the Maldives’. As for elections, they should depend on ‘the wish of the Maldivian people’. He said that Sri Lanka’s President Rajapaksa was in touch with the party leaders in the Maldives and has ‘good relations with all’. Soon after Nasheed’s overthrow, the governments of India and the US indicated recognition of the new dispensation in the Maldives. India’s Prime Minister Manmohan Singh sent a letter of felicitation in which he ‘assured the new President of the Maldives, Dr Mohamed Waheed, of continued support to the Maldivian people and co-operation with the government of the Maldives’. A report in the Times of India on 10 February said that ‘India was actively involved in the changeover’, with Indian ships and planes ready to carry out an evacuation of Indian nationals if the need arose. In spite of concerns expressed by the Commonwealth Ministerial Action Group and the Inter-Parliamentary Union regarding the circumstances of the power changeover in the Maldives, no country’s government has openly condemned the events that Nasheed has described as a coup.